Floating Shelves, sleek and simple design, add clean and fresh look to home decoration, enable you display your collectings conveniently . We supply white, black, red, green, blue, purple, silver, golden, natural, walnut, maple, birch and other finish floating wall shelvings for your selection . Easy fro clean and anti water. Unique design hidden brackets mounting system is easy for installation and can hold shelf board firmly to wall, hardware and installation instruction will be supplied in each packaging. 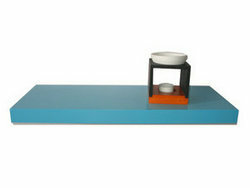 Floating shelf can be installed one piece only or several pieces together. 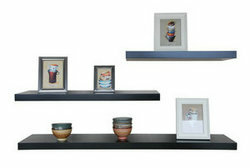 Work with other shelves such as pentagon corner shelves, it will create a fresh look.